Traveling down the 2-lane road from Montalcino to the village of Castelnuovo dell’Abate, I am stunned by the beauty of the area. It’s September and well-tended rows of Brunello grapes line both sides of the road, waiting patiently for harvest after the hot summer. Acting on a tip from Arnaldo Rossi, my Sommelier buddy based in Cortona, I’m in search of a Brunello di Montalcino to bring home to Portland. The family estate of Mastrojanni is my destination. The Brunello di Montalcino DOCG wine region is centered on the famed hill town of Montalcino known for its rich, powerful red wines made from Sangiovese Grosso grapes. 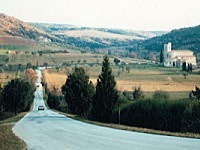 The wine estate of the Mastrojanni family is located on the southeast side near the village of Castelnuovo dell’Abate. Stopping in the village to take in the view of the valley and nearby Mount Amiata, I hear the gentle prayer song of Gregorian Chant drifting up from below. The monks at the 12th century Abbey of Sant’Antimo grace the valley and nearby hills with their peaceful chant at regular intervals through the day. “You’ve caught us during the harvest,” says Andrea Machetti, as I pull up at the classic Tuscan stone house now used for their operations. I know exactly what that means — it’s an exceptionally busy time for the family and hired hands who help with the vendemmia, or grape harvest, and I fear I may be more of a nuisance than a guest. Yet, Andrea graciously accepts my visit with a hearty handshake and quickly proceeds to tell me about the history of the place. “The Mastrojanni family dates back centuries, but they settled this knoll for Brunello production in 1975,” says Andrea. “We were fortunate. 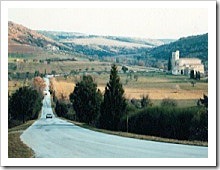 The southeast exposure is superb, the micro-climate is uniquely influenced by nearby Mount Amiata, and the soils are rich in gravel and clay. It’s hard to imagine a better place to grow the Brunello clone (Sangiovese Grosso).” I ask half-joking whether the nearby Abbey influences the wine, or just the winemaker. 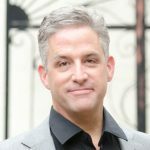 He laughs, “We believe that the terroir has a tremendous influence on the wine. Everything around us finds its way into the grapes. Perhaps the serenity of the sound of the Chant translates into the wine.” After tasting a few of their offerings, I’m a believer. Mastrojanni offers a blockbuster collection of reds and a fantastic sweet wine in the Vin Santo (literally translated as “Holy Wine”) style. 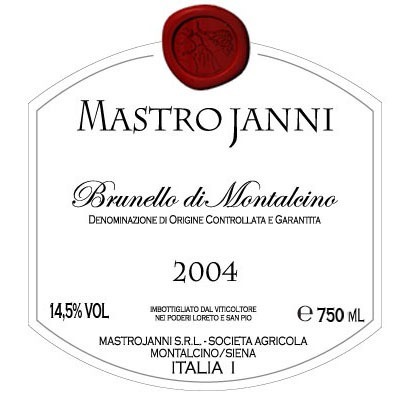 Their Brunello di Montalcino 2004 has a deep, concentrated garnet red color with a classic Brunello nose of tobacco, pepper, ripe black cherry and even a touch of roasted chestnut. With the presence of well-integrated tannins, this wine will lay down well in your cellar and be optimal for drinking in 2011-2020 — but don’t hesitate to open a bottle today to enjoy with a good lamb stew or Bistecca Fiorentina. 2004 was a blockbuster year for Brunello, and at $40-50 retail, this Brunello is a steal. My favorite Mastrojanni red for drinking now is their fantastic Rosso di Montalcino 2007 a ready-to-drink Sangiovese that delivers the true essence of the Montalcino area on the nose and palate. Lots of earthy notes with black cherry and fresh violets, the wine soars on the palate with a silky texture and just the right amount of acidity and tannin. Priced around $20 retail, this is the best Rosso I’ve tasted in years. Pair this young but sturdy wine with game meats, grilled lamb like agnello scottadito(see our recipe below), and aged sheep’s milk cheeses like Pecorino di Pienza. For Cabernet Sauvignon lovers, Mastrojanni has released an elegant blend of Sangiovese and Cab with their Super Tuscan San Pio 2004. What a knockout. 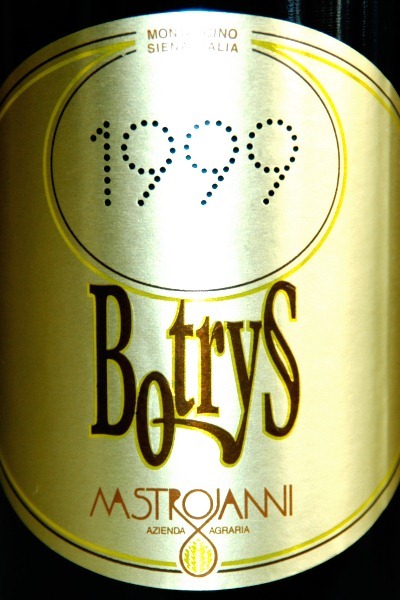 With an intensely perfumed nose of leather and concentrated black and berry fruits, the wine immediately draws you in. 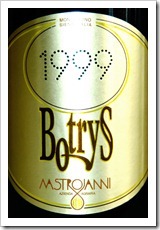 Very smooth tannins make this wine ready to drink today and will cellar well for years. You’ll find it for about 28 bucks retail. Try it with beef, wild boar or venison spiedini (kebabs). Visiting Mastrojanni. The drive to Mastrojanni leaves me in a blissful state of mind. Located just 9 km from Montalcino, yet deep in the true heart of Tuscany, a visit to Mastrojanni and the nearby Abbey of Sant’Antimo will calm your soul and make you a believer. To find Mastrojanni, just follow the signs from Montalcino to the village of Castelnuovo dell’Abate, then follow the signs to Mastrojanni. Be sure to contact Andrea Machetti in advance to schedule a time to visit; you can reach him at +39 0577.835.681. 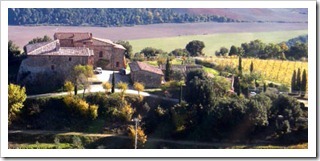 Need a place to use as your home base while exploring nearby Brunello and Vino Nobile wineries? Consider Vecchia Oliviera, a charming 3-star hotel right at the gates of Montalcino (tele: +39.0577.846.028, email: info@vecchiaoliviera.com). On our grand Veneto-to-Puglia exploration of Italy a few years ago, Teresa and I had the great fortune to find ourselves in the small town of Norcia, nestled deep in the verdant forests of southeastern Umbria, just before the lunch hour. Norcia is the home of all things pork and is best known for its wild boar, porcini mushrooms and truffles — all hunted and collected in the nearby forests. Norcia is just across the border from the Italian province of Abruzzo where lamb dishes have been elevated to an art form. As we mill around the ancient cobblestone roads of the centro storico in search of a local trattoria, we happen across a small restaurant with a dozen small tables. Since it is only noon, the trattoria is empty but the owner greets us and asks if we would like to make a reservation. As we book our lunch for one o’clock, I can’t help but notice the sounds and smells drifting from the kitchen just off the main room. We peek around the corner in hopes of a glimpse of what’s on today’s menu. We are immediately coaxed into the kitchen by a little nonna in her seventies, obviously the matriarch of the establishment, busy chopping up a whole lamb freshly butchered. A wood fire blazes in the oven and the smells of rich pasta sauces permeate the room. Whack! “You are joining us for lunch?” We nod a simple yes, our eyes bulging in astonishment as the nonna’s strength. “Agnello Scottadito!” Whack! “It’s the best!” Who are we to disagree with the wisdom of the ages? We return at our assigned time and are treated to the most succulent lamb chops we’ve ever tasted, served still sizzling only moments away from the wood-fired grill. Agnello (an-YELL-oh), or young lamb, has its prime season in the spring in Italy, largely because they prefer young lamb that is 8 to 16 weeks old. Here in the States, local lamb shows up in the fall after they’ve had a chance to grow for 5 or 6 months. This old world recipe for grilled lamb works fine with our American lamb chops. While you can cook these chops in a pan or over a gas barbeque, grilling over wood or hardwood charcoal is the best. Grilling alla brace (over coals) lends a heavenly taste that is incomparable. Serves 6 people. Prepare a marinade by mixing the oil, rosemary leaves, and garlic in a small mixing bowl. Spread the mixture on both sides of the chops and set them in a small, shallow pan. Pour any remaining marinade over the chops in the pan. It’s best to let the chops rest in your refrigerator for several hours or even overnight, but it’s not absolutely necessary. When you’re ready to grill, fire up your charcoal or cooking wood. I personally prefer apple or cherry wood, but oak or even chestnut works well. When the fire is ready and the coals are glowing, set the grill over the heat for a few minutes. Place the chops on the hot grill and let them cook for a couple of minutes, then flip them and grill the other side. Sprinkle a little salt and a generous grinding of fresh black pepper on the chops. I recommend that you cook the meat medium-rare for the best flavor and tenderness — typically about 3-5 minutes, depending on how hot the fire is and the thickness of the chops. Scottadito means “burned fingers”, and that’s how you should serve the chops. When they’re ready, take them immediately from the grill to the table and enjoy. Using your fingers makes them taste better. Brunello fan? What’s your favorite? 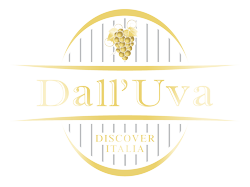 The Brunello wines of Montalcino show off the best of what can be done with the noble Sangiovese Grosso clone. Do you have a favorite from the region? Biondi Santi? Siro Pacenti? 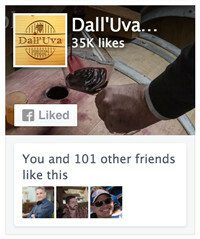 Tells about your likes and dislikes, share with the rest of the Italian wine enthusiasts – we’d love to hear your thoughts.